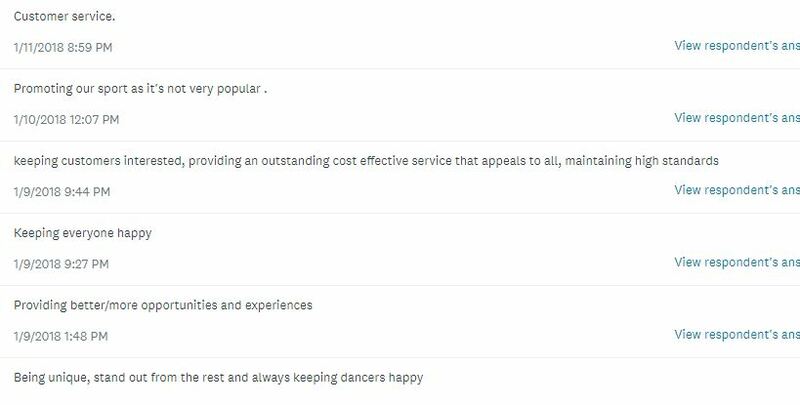 In January 2018 we sent out an open invitation for our current dance school teacher/owner clients to take part in our customer service survey. One of the questions was ‘Would you like to know to overall results when the survey is completed by all applicants?’ and 84% answered YES. We thought that we might as well share them with you too, to help hold us accountable to us working towards addressing some of the points displayed below and creating a better experience when using our services overall. Sometimes it’s hard to hear the truth, but we know that it’s imperative to know our weaknesses as well as our strengths in order for us to grow. We had a total of 19 completed surveys which we are so grateful for our customers willing to be a part of our growth and share their honesty, good or bad, it was all in aid to help. Thank you! The survey was anonymous to encourage more honesty. 1. Please rate us in your opinion on the following. 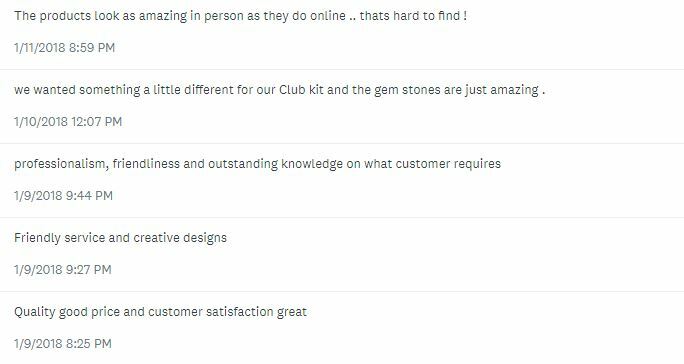 Customer Service: As we try to go above and beyond for our customers, no matter how small the issue we were glad to hear the we were Great or better most of the time! Admittedly though, towards the end of last year, we were a little slack and slow with email communication. It’s not something we feel good about but have but things in places to prevent that happening again. If there is ever any other serious issue, we are always accessible via phone and Facebook – It’s very rare that we’ve left a customer unhappy with an unresolved problem. Quality: We are really happy to hear that over 80% think our quality is great most of the time. We only use the best grade printing materials, the manufacturers own or better – even the rhinestones are the best AAA grade Korean glass rhinestones which can only be topped by DMC, Preciosa Crystal and Swarovski Crystal, which we can provide but of course would have to be charged for. We have tried and tested our most basic garments which haven’t had many returns over the past 7 years, ones that have are normally factory defects which are replaced with no questions asked 🙂 Garment upgrades are always available at a higher cost, so really, the quality is in control of our customers budget. Design: We LOVE designing and making your prints that little bit different, we are thrilled that nearly 95% of you feel like we excel in this area! Design requests are increasing every month and hope that by the end of the year we will have a dedicated designer working full time with you on the cool designs and projects. This is a snap shot of the first 5. Our most important core value is Customer Service, but not in a ‘salesy’ way – more like a friend or family member. So we were really pleased to here that that our customers felt the same. Top pluses were Friendliness, Quality and Design. Embroidery is actually a service we provide, we openly outsource but take care of the headache of organising it all for you and have quality control. Turnaround time was again an area of concern and that is one of our main areas of improvements to focus on this year. 4. What type of merchandise/clothing options would you like to see more available to customise? The general consensus for this question was more ‘Dance wear’ – like more sporty, tight fitted garments. The leading manufacturers for garment decorators have definitely upped their game with fitness wear but it does still lack in the kids area. We have currently partnered with a new manufacturer in the UK who will be making bespoke dance wear for us, Jackets, Leggings, Crop Tops, Hot Pants, Leotards and other dance items but these are made to order and will have minimum order quantity of 10pcs to get started. They can be quite costly as we only use the best material (Meryl) which is manufactured here in the UK too. Lycra and Cotton Lycra can be used upon request. With this partnership of high grade dance wear and Axznt garments design and decoration, the end result can be truly amazing! Pattern options and details are available in our Dance Teachers Area or by email request. 5. Do you use any other suppliers? If so, what are the reasons why? Ultimately, we asked this question to see if there was a repeating pattern with the view on our service which pleasantly surprised us. We anticipated a much lower percentage using only our service and higher percentage using another supplier because of price. I’m glad the honesty is there an sometimes we even encourage using an alternative supplier for use or price if we can’t accommodate your requests. We will even research and advice where need be. This was an optional question because it doesn’t have anything to do with our service as a clothing supplier, but being a dancer and teacher myself, I was interested in the possible concerns with the everyday dance school teacher/owner because I feel that it can sometimes by a lonely road, business as a whole is! As a fellow business owner and dancer – I want to provide a platform where I can help you improve your business too… Anybody, not just our current clients can take and have already taken advantage (in a good way) of my business journey and experience so far. It only takes an email to ask a question! I’m always hear to help. This little snap shot can also put some at ease knowing that you’re not alone! Everyone has worries and problems that they constantly face, don’t be afraid to talk to each other as you all have experiences that could help one another. I was interested to see where our clients were on their professional journey. Although you don’t need a website, a Facebook page can and does supply enough to create a valuable business but it still lacks growth potential. A website is like your online business card/CV and can still say a lot about your and your school. Although Social Media and mobile usage is massive, we still naturally check for a website to make sure the business is ‘legit’ and can easily be a deciding factor whether to use your services or not. I plan to talk more about this topic in the future! And that’s it complete, we have a lot of work to do and have planned much more to improve the experience of our customers. * Dedicated danceschool teachers area on website with all info you need to have a stress less order experience and also a few hints and tips to help with business in general. Did these questions and answers give you a good insight into Axznt? Was there something missed that you think ought to be addressed? Please feel free to comment below! Thanks again to those who participated, we will do better for you!